Performers include: H. Jon Benjamin, Dan Mintz, Eugene Mirman, John Roberts, Kristen Schaal, Andy Kindler, and Larry Murphy. 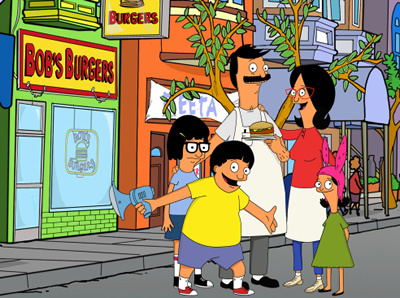 Bob Belcher (H. Jon Benjamin) is a third generation restaurateur who operates Bob’s Burgers with the help of his wife and their three kids. He has big ideas about the food he serves but knows little about customer service or how to run a business. Despite his greasy counters, lousy location, and occasionally spotty service, Bob is convinced his burgers speak for themselves. The restaurant is constantly struggling and there are times when it doesn’t seem like his family is on his team. Bob’s wife, Linda (John Roberts), supports his dream through thick and thin but is getting a bit tired of the thin part. Eldest daughter Tina (Dan Mintz) is a 13-year-old hopeless romantic with minimal social skills. Middle child Gene (Eugene Mirman) is an aspiring musician and prankster who’d rather be serving up jokes than burgers. Youngest daughter Louise (Kristen Schaal) is the only member of the family who loves the restaurant like her dad. Unfortunately, Louise has an off-balance sense of humor and lots of energy which can sometimes bring more trouble than assistance. The location of Bob’s Burgers certainly doesn’t help business. It’s located next door to It’s Your Funeral Home and Crematorium, down the street from an oceanside amusement pier called Wonder Wharf, and right across the street from Jimmy Pesto’s Pizzeria, Bob’s main competition. i love this show. i would like to have a bobs burgers kitchen set. for example never knew about topsy until the ep. Stupidest thing I have ever seen. No wonder today’s youth is brain damaged.